This article summarizes the design attributes and the effectiveness of treatment systems that treat urban stormwater and agriculture irrigation runoff to remove pesticides and other contaminants associated with aquatic toxicity. Anderson, B. S., Phillips, B. M., Voorhees, J. P., Cahn, M. Vegetated Treatment Systems for Removing Contaminants Associated with Surface Water Toxicity in Agriculture and Urban Runoff. J. Vis. Exp. (123), e55391, doi:10.3791/55391 (2017). Urban stormwater and agriculture irrigation runoff contain a complex mixture of contaminants that are often toxic to adjacent receiving waters. Runoff may be treated with simple systems designed to promote sorption of contaminants to vegetation and soils and promote infiltration. Two example systems are described: a bioswale treatment system for urban stormwater treatment, and a vegetated drainage ditch for treating agriculture irrigation runoff. Both have similar attributes that reduce contaminant loading in runoff: vegetation that results in sorption of the contaminants to the soil and plant surfaces, and water infiltration. These systems may also include the integration of granulated activated carbon as a polishing step to remove residual contaminants. Implementation of these systems in agriculture and urban watersheds requires system monitoring to verify treatment efficacy. This includes chemical monitoring for specific contaminants responsible for toxicity. The current paper emphasizes monitoring of current use pesticides since these are responsible for surface water toxicity to aquatic invertebrates. Surface water toxicity is prevalent in California watersheds and decades of monitoring have shown that toxicity is often due to pesticides and other contaminants1. The primary sources of surface water contamination are stormwater and irrigation runoff from urban and agriculture sources. As waterbodies are listed as degraded due to contaminants and the toxicity is identified from urban and agricultural sources, water quality regulators partner with state and federal funding sources to implement practices to reduce contaminant loading. Green infrastructure is being promoted in California urban watersheds to reduce flooding and increase the recovery of stormwater through infiltration and storage. While Low Impact Development (LID) designs are being mandated for new construction in many regions, few studies have monitored the efficacy of these systems beyond measurements of conventional contaminants like dissolved solids, metals, and hydrocarbons. More intensive monitoring has recently evaluated reductions in chemical concentrations and chemical loading responsible for surface water toxicity, and to directly determine whether bioswales reduce toxicity of runoff. This has shown that bioswales are effective at removing toxicity associated with some contaminant classes2, but additional research is required for emerging chemicals of concern. Vegetated treatment systems are also being implemented in agriculture watersheds in California, and these have been shown to be effective at reducing pesticides and other contaminants in agriculture irrigation runoff3,4. These systems represent components of a suite of approaches to reduce contaminant loading to surface waters. Because they are intended to mitigate contaminants responsible for surface water toxicity, a key component of the implementation process is monitoring to ensure their long-term effectiveness. Monitoring includes both chemical analyses of chemicals of concern, as well as toxicity testing with sensitive indicator species. This article describes protocols and monitoring results for an urban parking lot bioswale and an agricultural vegetated drainage ditch system. The design attributes of a typical parking lot bioswale, such as may be used to treat storm runoff in a typical mixed-use urban shopping parking area depend on the area being treated. In the example described here, 53,286 square feet of asphalt create an impervious surface area that drains to a swale, which consists of 4,683 square feet of landscaping. To accommodate runoff from this surface area, a 215 feet long flat-bottom, semi-V shape channel comprises the swale with a side slope less than 50% and a longitudinal slope of 1% (Figure 1). This swale comprises three layers including native bunch grass planted in 6 inches of topsoil, layered over 2.5 feet of compacted subgrade. Stormwater flows from parking areas to multiple entry points along the swale. The water infiltrates the vegetated area, then permeates the subgrade and drains into a 4-inch perforated drain. This system drains water through a system plumbed to an adjacent wetland that eventually drains into a local creek. Sample 4 L of pre-treatment stormwater leaving the parking lot as it enters the bioswale inlet, and then 4 L of post-treatment stormwater as it leaves the bioswale through the 4" outlet drain. Using local weather predictions, collect samples at the beginning, middle, and end of the storm's hydrograph. Composite the samples to characterize runoff variability during the storm event. Collect 1.3 L samples by hand and composite them in a 4 L amber bottle. Collect inlet samples at several curb openings where storm water flows into the bioswale. Collect 1.3 L outlet samples from the flow meter attached to the outlet drain (described below) and composite them in a 4 L amber bottle. Store the composited samples on ice until the final hydrograph sample is collected. Then transport them to the laboratory and hold in a refrigerator at 4 °C prior to subsampling for chemistry and toxicity testing. Ship samples to the chemistry lab within 48 h of sample collection. Prior to the storm, install a tipping-bucket digital logger rain gauge by attaching it to a light or other pole adjacent to the bioswale site. Use the rain data to indicate instantaneous and total rainfall for the site. Install a mechanical geared pulse flow meter on the outlet drains of the bioswale. Record total flow exiting the bioswale. NOTE: Reduction in runoff volume is presumed to reduce overall loading of contaminants in LID designs. Model the volume of water falling on the parking lot catchment area during the rain event by extrapolation using the inches of rain recorded by the rain gauge. Use these data to determine the volume entering the treatment system based on parking lot surface area. Use the total flow recorded by the outlet flow meter to calculate infiltration percentage. Calculate the difference between inlet and outlet volume to determine stormwater infiltration. Calculate contaminant loading and load reduction percentages during the storm using inlet and outlet volume in conjunction with contaminant analytical measurements. Measure chemical analytes that are relevant to surface water toxicity (as discussed below). Total chemical groups to simplify load calculations and base on their similar toxic modes of action (e.g., total polynuclear aromatic hydrocarbons [PAHs], total pyrethroids, and total fipronil and degradates). Analyze all samples for the following parameters: total suspended solids (TSS), trace metals (USEPA method 200.85; inductively coupled plasma-mass spectrometry [ICP/MS]), and PAHs (USEPA method 6256). Analyze samples for current-use urban pesticides, including 9 pyrethroids (USEPA method SW846 8270 modified7; bifenthrin, cypermethrin, fenvalerate/esfenvalerate, permethrin, tetramethrin, L-cyhalothrin, cyfluthrin, and allethrin), and fipronil and its three primary degradates (fipronil sulfide, fipronil sulfone, fipronil desulfinyl). Analyze pyrethroids using gas chromatography-mass spectrometry (GC/MS) using negative chemical ionization or other appropriate method to provide adequate detection limits. Since most current-use pesticides are highly toxic at low concentrations, their analyses require low chemical reporting limits to be relevant for environmental risk assessment. The method reporting limits for pyrethroids are from 0.5 ng/L to 1.0 ng/L for all pyrethroids except permethrin (reporting limit = 10 ng/L). Use an analytical procedure for fipronil that provides a method reporting limit of 1.0 ng/L. Organophosphate pesticides do not need to be measured depending on local use patterns for example in urban areas in California8,9. Measure neonicotinoid pesticides (e.g., imidacloprid) using ultra performance liquid chromatography coupled to a triple quadrupole mass spectrometer, which has a reporting limit for imidacloprid of 50 ng/L. Conduct toxicity tests on the composited inlet and outlet stormwater samples using 3 test species, following modified US Environmental Protection Agency (USEPA) acute test protocols10. The test with the cladoceran Ceriodaphnia dubia measures survival after 96 h. The test with the amphipod Hyalella azteca measures survival after 10 days. The test with the midge Chironomus dilutus measures survival and growth after 10 days. Conduct acute 96 h survival tests with the cladoceran C. dubia following U.S. EPA guidance. Expose five C. dubia neonates in each of five replicates of inlet and outlet stormwater samples. Replicates consist of 20-mL scintillation vials containing 15 mL of test solution. Feed neonates a mixture of yeast, cerophyll, trout chow (=YCT; following U.S. EPA guidance) and Selenastrum algae 2 h prior to daily 100% renewal of the stormwater test solutions. Record total number of surviving neonates daily. Compare final C. dubia survival after 96 h exposure to inlet and outlet stormwater samples to survival in moderately hard control water using a t-test. Follow statistical procedures recommended by U.S. EPA. Conduct acute 10 d survival tests with the amphipod H. azteca following U.S. EPA guidance. Expose 10, 9 days to 15 days old amphipods in each of five replicates. Replicates consist of 300-mL glass beakers containing 200 mL of test solution. Conduct amphipod tests for 10 days, count the number of surviving amphipods daily, and renew 50% of the test solution every 48 h. Feed each beaker every 48 h with 1.5 mL of YCT after the renewal. Compare final survival of amphipods in stormwater samples to 10 days survival in laboratory well water as described above. Conduct chronic 10 d survival and growth tests with the midge C. dilutus following U.S. EPA guidance. Expose 12, 7-d old animals in each of four replicates. Replicates consist of 300 mL glass beakers containing 200 mL of test solution. Supply each midge test container with 5 mL of sand as substrate for tube building by the larvae. Conduct tests for 10 d, and renew 50% of the test solution every 48 h for each beaker daily with an increasing amount of fish food slurry (4 g/L), as follows: days 0 to 3, 0.5 mL/day; days 4 to 6, 1.0 mL/day; days 7 to 10, 1.5 mL/day. Compare final survival and growth in stormwater samples to 10-d survival in laboratory well water as described above. Measure growth of surviving animals as ash-free dry weight at 10 d compared to initial weight of the test organisms. For all toxicity tests, measure dissolved oxygen, pH, and conductivity using appropriate meters and electrodes. Measure un-ionized ammonia using a spectrophotometer. 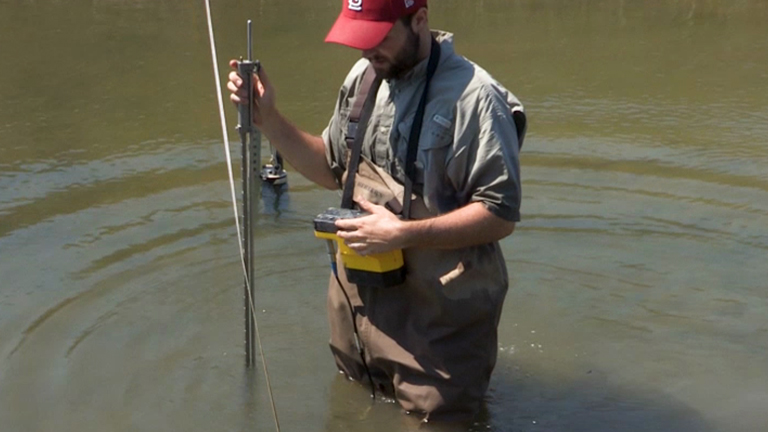 Record water temperature with a continuous recording thermometer. NOTE: The agricultural drainage ditch used in the current example is 152 m long and has a semi-V-shaped cross-section width of 5 m at the top and 1 m depth. The ditch vegetation is a combination of native grass species primarily seeded with red fescue (Festuca rubra). In this example, integrated vegetative ditch trials consisted of granulated activated carbon (GAC) and compost filter treatments integrated with the vegetated ditch. Construct two compost filters and six carbon filters and install them in three different sections of the vegetated ditch (Figure 2). Use 2 m long 20 cm diameter sleeves filled with either carbon or compost. Fill six sleeves with 30 L of granulated activated carbon and place these across the ditch at the 146 m point, near the end of 152 m vegetated ditch. Anchor the GAC-filled sleeves to the ditch bottom with wire stakes on the upstream edge. Place a 2.5 m long 6" wide section of pine board on the downstream edge of each of the GAC sleeves. Dig the pine boards into the two sides and bottom of the channel to minimize water bypassing and undercutting the carbon sleeves. The boards will also provide vertical support to maximize water contact time with the carbon. Fill the compost sleeves with approximately 15 kg each of partially decomposed yard waste from any clean source, such as a local landfill. Position two 2 m long compost sleeves across the vegetated channel at 64 m and at 123 m along the length of the 152 m vegetated ditch (Figure 2). NOTE: This protocol describes methods for conducting simulated agricultural runoff trials and associated monitoring to evaluate treatment efficacy using the integrated vegetative treatment system. In the current example, the integrated vegetated-compost-carbon system was evaluated at two flow rates that represented rates typical off-field discharge from commercial farms in the Salinas Valley, 3.2 L/s and 6.3 L/s. The organophosphate pesticide chlorpyrifos was used as a model pesticide in these trials because it has a moderate solubility, and therefore represents the mid-range of solubility of representative pesticides commonly used in pest management. Chlorpyrifos is also the subject of on-going regulatory actions in central California because of its impacts on agriculture watersheds. The target chlorpyrifos dose was approximately 2,600 ng/L. Flow rates and target chlorpyrifos concentrations were within the ranges previously measured in local irrigation runoff 3,11. The hydraulic residence time for a pulse of water transiting the vegetated ditch was not monitored in the example given here. The residence time in these systems vary with water inflow rate, the degree of soil saturation due to previous irrigation and rain, the presence of structures to impede flow such as weirs and sedimentation basins, and the amount of surface area covered by vegetation. Previous studies have demonstrated residence times of several hours for small scale ditch systems in the Salinas Valley 3,4. Visual observations indicated the residence time for the GAC filters was one or two minutes. Create simulated agricultural runoff using ground water mixed with suspended sediment. For trials with the model pesticide, chlorpyrifos, prepare a fresh stock solution of 10 mg/L for every 3.2 L/s trial by adding certified stock solution to a known volume of distilled water. Prepare a fresh chlorpyrifos stock solution of 20 mg/L for every 6.3 L/s trial. Use a metering pump to provide a consistent volume of stock solution to the runoff water before it enters the vegetated treatment ditch inlet. Use the metering pump to deliver stock solution at 50 mL/min to the flow of simulated irrigation water. Monitor the inlet flow rate with a digital meter and use these data to quantify total volume of runoff water applied to the ditch inlet. Construct a weir at the outlet of the ditch and plumb this with an outlet pipe connected to a digital flow meter. Use this meter to record the volume of runoff exiting the ditch. Use data loggers connected to the digital meters to record flow at 5 min intervals. Program the data loggers to activate peristaltic pumps located at the inlet and at various stations (e.g., 23 m, 45 m, and 68 m) below the inlet of the ditch to collect composite subsamples of runoff into stainless steel containers at 5 min intervals. Transfer composite samples of runoff water from trials into amber glass bottles at the end of each runoff trial and maintain the samples on ice at 4 °C for later toxicity and chemical analyses. Analyze the composite samples for total suspended solids (TSS), and chlorpyrifos using GC-MS or enzyme-linked immunosorbent assays (ELISA). Compare "inlet" composite samples (pre-treatment) to "outlet" composite samples (post-treatment) to evaluate efficacy of the integrated ditch system to reduce TSS and pesticide loads. Determine water column toxicity was in composite samples from the inlet (pre-treatment) and outlet (post-treatment) of each trial using 96 h Ceriodaphnia dubia toxicity tests10, as described above for the bioswale monitoring. C. dubia is an appropriate monitoring species for agriculture runoff toxicity due to its sensitivity to chlorpyrifos (median lethal concentration (LC50) = 53 ng/L12). During the 18.5 h of the storm, 1.52" of rain was recorded by the rain gauge, and this resulted in 50,490 gallons of water flowing from the parking lots into the bioswale. Of this total volume, 5,248 gallons were recorded by the outlet flow meter, resulting in a total infiltration of 90% of the stormwater that flowed into the bioswale. The bioswale reduced all of the chemicals monitored. Total suspended solids were reduced 72% (Table 1). Concentrations of PAHs were very low when they were detected, but all concentrations of PAHs were reduced by 100%. All metals were reduced in the outlet samples. Zinc and copper were reduced by 97% and 92%, respectively (Table 1). A number of pyrethroid pesticides were detected in the inlet samples and all of these were reduced in the outlet samples. Total pyrethroid concentrations were reduced 99%. Toxic concentrations of the pyrethroids bifenthrin, cypermethrin, lambda-cyhalothrin, and permethrin were detected in the inlet samples, and were reduced to concentrations below median lethal concentrations (LC50s) for H. azteca in the outlet samples (Table 1). For example, bifenthrin was detected at a toxic concentration in the inlet sample and was reduced by 93% in the outlet sample. Treatment of the phenylpyrazole pesticide fipronil was inconsistent. The parent compound of fipronil was detected in the inlet sample and was reduced by 100% in the outlet sample. The fipronil degradates, fipronil desulfinyl and fipronil sulfone were detected in the inlet sample. The desulfinyl degradate was reduced 100% in the outlet sample, but the sulfone degradate increased by 45%. Possible reasons for the variable treatment of fipronil include its moderate solubility. The neonicotinoid pesticide imidacloprid was not detected in the inlet sample. Toxicity of the stormwater varied by species tested. None of the inlet samples were toxic to daphnids (Table 1). All inlet samples were toxic to H. azteca and toxicity was reduced by the bioswale. Amphipod survival was 66% in the inlet sample, and improved to 98% in the outlet. Toxicity to C. dilutus survival was observed in inlet and outlet samples. Significant reductions in C. dilutus weight were observed in the inlet sample, and growth significantly improved by 49% in the outlet sample (Table 1). Efficacy of the integrated vegetated ditch system to treat chlorpyrifos varied depending on the flow rate, but TSS and chlorpyrifos in spiked irrigation water were significantly reduced at both flow rates. The average TSS reduction in the three trials conducted at 3.2 L/s and 6.3 L/s was 79.7% and 82.3%, respectively. Chlorpyrifos was reduced from about 750 ng/L to less than detection (<50 ng/L) in two of the low flow-rate trials, and to an estimated concentration of 78 ng/L in the third trial (below reporting limit). Chlorpyrifos was reduced from an average of 707 ng/L to less than 100 ng/L in all three trials at the higher flow rate. When combined with infiltration, average load reductions were 98% and 94% for the low and high flow rates, respectively (Table 2). Complete mortality to C. dubia was observed in all inlet samples (pre-treatment). Two of the 3.2 L/s outlet samples and one of the 6.3 L/s outlet samples were not toxic (Table 2), corresponding to the outlet samples with the three lowest chlorpyrifos concentrations. Figure 1: Image of a parking lot bioswale. Inlet (untreated) stormwater samples were collected from several of the curb openings to the bioswale. Outlet (treated) stormwater samples were collected from a drainage pipe located inside an overflow grate located at the top of the image (not shown). Please click here to view a larger version of this figure. Figure 2: Schematic diagram of integrated vegetated ditch system (152 m length, not to scale). Entire ditch was vegetated with red fescue grass. Compost and GAC installations were placed as shown. Please click here to view a larger version of this figure. Table 1: Toxicity and chemistry of bioswale inlet and outlet monitored during one storm. TSS = total suspended solids; ND = not detected. Table 2: Chlorpyrifos concentrations, total suspended solids concentrations, and percent survival in composite samples from replicate trials evaluating the effectiveness of the integrated ditch treatments at two flow rates (3.2 L/s and 6.3 L/s). Asterisk indicates significant reduction in toxicity. The practices described in this protocol are intended as final steps in an overall strategy to remove pollutants in agriculture irrigation and stormwater runoff. Use of bioswales and other urban green-infrastructure LID practices are intended as a final piece of the puzzle to remove contaminants in runoff before they reach adjacent receiving waters. This protocol emphasizes methods to monitor urban bioswales to determine treatment efficacy for removing toxicity associated with urban contaminants, with emphasis on current use pesticides. Critical steps in designing monitoring studies include modeling approaches and sampling designs to capture storm hydrographs, appropriate analyte lists with adequate detection limits, and use of toxicity indicators and endpoints appropriate for urban contaminants known to cause surface water toxicity. For example, removal of degradates of the phenylpyrazole pesticide fipronil were inconsistent, likely due to its moderate solubility2,13. Modifications of current bioswale designs might be required to address specific contaminants not completely removed by bioswales and other LID practices. For example, use of highly soluble neonicotinoid pesticides is increasing, and these do not readily sorb to plant sources14. Treatment of more soluble pesticides may require additional steps, such as filtering using GAC4. Vegetated treatment systems used to remove pesticides and other contaminants from agriculture irrigation runoff combine design components similar to the bioswales. Integrated vegetated drainage ditches include sedimentation areas designed to allow coarse suspended particles to settle, followed by vegetated sections for sorbing pesticides. Studies have shown these treatments remove agriculture-related contaminants by promoting infiltration, and removal of pesticides through sorption to settled particles and plant surfaces15,16. Studies have also shown that removal efficiencies vary depending on the target contaminant, and that more soluble pesticides are more difficult to remove3. Since the goal is to reduce pesticides to non-toxic concentrations before they enter receiving waters, additional treatment has been required to serve as "polishing" steps. These include use of treatment enzymes3,4,17, and more recently, use of GAC. Systems that incorporate GAC will likely be more effective4, and recent experiments have demonstrated that the neonicotinoid imidacloprid was completely removed by GAC at field flow rates and concentrations (Voorhees et al., in press21). Practical considerations for growers interested in incorporating GAC into integrated vegetated treatment systems will be ease of use, GAC life-expectancy, and procurement and disposal costs. For example, current procurement and disposal costs for GAC are approximately three dollars per pound. These are the subjects of on-going research. As in the example presented here, the effectiveness of GAC in the field can be extended by incorporating GAC-filled treatment sleeves at the end of vegetated systems, after the sedimentation and vegetated ditch sections have removed the majority of suspended particles and contaminants4. Cost considerations for installation and maintenance of all components of integrated vegetated treatment systems for agriculture and bioswales for urban runoff will require more detailed techno-economic feasibility studies18. As pesticide use patterns evolve with regulation of older classes such as organophosphates for urban use and increased use of newer classes, such as pyrethroids, phenylpyrazoles (e.g., fipronil) and neonicotinoids (e.g., imidacloprid), it will be important to use test species sensitive to the most commonly used pesticides. The two species used in the urban bioswale example described in this paper are among the most sensitive species to current-use pesticides. The amphipod H. azteca is highly sensitive to pyrethroid pesticides19 and some organophosphates, and C. dilutus is among the most sensitive species to fipronil and its degradates, and to neonicotinoids20. Given the variable performance of vegetated systems for treating these classes of pesticides, it is important to incorporate appropriate toxicity tests for post-treatment monitoring of urban and agricultural waste water to ensure they are protecting receiving waters. Funding for the work described here came from the California Department of Pesticide Regulation and the California Department of Water Resources. Anderson, B. S., Hunt, J. W., Markewicz, D., Larsen, K. Toxicity in California Waters, Surface Water Ambient Monitoring Program. California Water Resources Control Board. Sacramento, CA. (2011). Anderson, B. S., Phillips, B. M., Voorhees, J. P., Siegler, K., Tjeerdema, R. S. Bioswales reduce contaminants associated with toxicity in urban stormwater. Environ Toxicol Chem. 35, (12), 3124-3134 (2016). Anderson, B. S., et al. Pesticide and toxicity reduction using an integrated vegetated treatment system. Environ Toxicol Chem. (30), 1036-1043 (2011). Phillips, B. M., et al. Mitigation Strategies for Reducing Aquatic Toxicity from Chlorpyrifos in Cole Crop Irrigation Runoff. California Department of Pesticide Regulation. Sacramento, CA. (2014). U.S. EPA. Method 1640: Determination of Trace Elements in Ambient Waters by On-Line Chelation Pre-concentration and Inductively Coupled Plasma-Mass Spectrometry. (Office of Water. Washington, DC. EPA 821-R-95-033, 65 (1995). U.S. EPA. Methods for organic chemical analysis of municipal and industrial wastetwater, Method 625- Base/neutrals and acids. Washington Office of Water. DC, 20460. U.S. EPA Appendix A to Part 136, 42 (1984). U.S. EPA. Method 1656: Determination of Non-conventional Pesticides in Municipal and Industrial Wastewater, Volume I. Revision 1 . Office Water. Washington, DC. EPA 821/R-93-010-A, 59 (1993). Johnson, H. M., Domagalski, J. L., Saleh, D. K. Trends in Pesticide Concentrations in Streams of the Western United States. J Am Water Resour Assoc. 47, (2), 265-286 (1993). Siegler, K., Phillips, B. M., Anderson, B. S., Voorhees, J. P., Tjeerdema, R. S. Temporal and spatial trends in sediment contaminants associated with toxicity in California watersheds. Environ Poll. 1-6 (2015). U.S. EPA. Methods for measuring acute toxicity of effluents and receiving water to freshwater and marine organisms. Office of Research and Development. Washington, DC. EPA-821-R-02-012, 275 (2002). Phillips, B. M., Anderson, B. S., Siegler, K., Voorhees, J. P., Tjeerdema, R. S. Optimization of an Integrated Vegetated Treatment System Incorporating Landguard A900 Enzyme: Reduction of Water Toxicity Caused by Organophosphate and Pyrethroid Pesticides. Final Report. Resource Conservation District of Monterey County and the United States Department of Agriculture Natural Resources Conservation Service and The California Department of Pesticide Regulation. Available from: http://www.cdpr.ca.gov/docs/emon/surfwtr/contracts/ucdavis_09-C0079_final.pdf (2012). Bailey, H. C., et al. Joint acute toxicity of diazinon and chlorpyrifos to Ceriodaphnia dubia. Environ Toxicol Chem. 16, 2304-2308 (1997). Supowit, S., Sadaria, A. M., Reyes, E. J., Halden, R. U. Mass balance of fipronil and total toxicity of fipronil-related compounds in process streams during conventional wastewater and wetland treatment. Environ Sci Technol. 50, (3), 1519-1526 (2016). Stang, C., Bakanov, N., Schulz, R. Experiments in water-macrophyte systems to uncover the dynamics of pesticide mitigation processes in vegetated surface waters/streams. Environ Sci Pollut Res. (2015). Schulz, R. Field studies on exposure, effects, and risk mitigation of aquatic nonpoint-source insecticide pollution: A review. J Environ Qual. 33, (2), 419-448 (2004). Moore, M. T., et al. Transport and fate of atrazine and lambda-cyhalothrin in a vegetated drainage ditch in the Mississippi Delta. Agric Ecosyst Environ. 87, 309-314 (2001). Phillips, B. M., et al. The Effects of the Landguard A900 Enzyme on the Macroinvertebrate Community in the Salinas River, California, United States of America. Arch Environ Contam Toxicol. 70, (2), Salinas River, California. 231-240 (2016). Han, W., Fang, J., Liu, X., Tang, J. Techno-economic feasibility evaluation of a combined bioprocess for fermentative hydrogen production from food waste. Bioresource Technology. 107-112 (2016). Solomon, K. R., Giddings, J. M., Maund, S. J. Probabilistic risk assessment of cotton pyrethroids: I. Distributional analysis of laboratory aquatic toxicity data. Environ Toxicol Chem. 20, 652-659 (2001). Weston, D. P., Lydy, M. J. Toxicity of the Insecticide Fipronil and Its Degradates to Benthic Macroinvertebrates of Urban Streams. Environ Sci Tech. (2014). Voorhees, J. P., Anderson, B. S., Phillips, B. M., Tjeerdema, R. S. Carbon treatment as a method to remove imidacloprid from agriculture runoff. Bull Environ Contam Toxicol. (2017).